Our online songwriting lessons are for all ages, children to adults. We even record and send you backing tracks for your songs. Above all, we make writing songs fun! No prior knowledge of music is needed! Understanding song structures, rhythm, harmonies and chords. Taking your composition/s through to completed song/s. Developing your singing voice to sing with confidence. How to perform your song like a professional! After you submit your enquiry for a free trial online songwriting lesson, Tracy will get back to you by email to arrange a time to meet for a chat over Skype, answer any questions and to arrange your free trial songwriting lesson. Ana takes online song writing and Skype singing lessons with our online singing teacher Carol. This is Ana’s own song which was mixed and produced by our online Cubase teacher Bohdan Syroyid. We can help you write your own songs from the first glimmer of an idea to a fully completed song. We can even help you perform your song by providing recorded backing tracks, singing tuition and direction in developing a professional delivery of your song. We will help you understand of the art of songwriting by expanding your understanding of lyrics, rhythm, and harmony & chords. A ballad, a folk or rock song, heavy or light and funny, every student wants to write a different song, so all our Songwriting Lessons Online are uniquely tailored exactly for what each student wants to write. 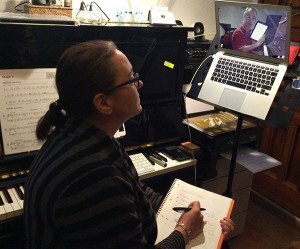 Tracy Rose – Founder of Music Lessons Anywhere online music school, piano and music teacher. Carol Hodge – Singing and music teacher. Mix Amylo – Online clarinet teacher, online saxophone teacher, singing and songwriting online and online piano teacher. Click here for more information about our teachers. All of us understand the importance of writing songs and the thrill of creating music from original ideas. It’s a privilege for us to be involved with the creative songwriting process with students and between us, we have a wealth of experience to guide you, stage by stage, to accomplish your finished piece. We make writing songs fun! The price of our Songwriting Lessons Online for individual students (live one-to-one tuition) is £30 per hour. Our Songwriting Lessons Online can also be managed for groups of students based in one location, or you and your friend/s from anywhere in the world can meet to share the lessons live online. 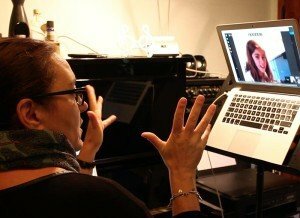 The cost for Online Singing Lessons for groups is £40 for an hour shared by two students or £50 for an hour shared by 3 to 5 students (maximum 5 students to a group lesson).